The forecast looks more or less the same for this weekend. We’ll have a dry (very dry for early August, to be honest) start to the day Friday before rain chances pick up through the weekend. If you live up north this is a really pleasant morning for this time of year, with lows as far down as 62 degrees in Crockett, and 65 in much of Montgomery County. Alas, closer to the coast temperatures are still in the mid- to upper-70s due to the influence of the Gulf of Mexico. I’m not sure what more we can expect as this is the dead of summer for us. A mostly sunny day, with high temperatures in the mid-90s. We can’t entirely rule out an isolated shower along the coast this afternoon as the sea breeze kicks in, but probably not. As moisture returns, we’re also going to say goodbye to these drier mornings. The story for the weekend remains pretty much the same. Weakening high pressure in concert with rising moisture levels will lead to an increased chance of rain showers this weekend. Overall confidence is low—some signals favor widespread rain, while others suggest showers will be more spotty to isolated in nature. With this in mind, we think there will be a 30 to 50 percent chance of rain for each of Saturday, Sunday, and Monday, with probably the better chances on Saturday and Monday. As for accumulations, as you know in Houston showers are sometimes hit or miss, with one block getting drenched, and the next block over sweltering. But generally, I think we can expect between 0.25 and 0.75 inches for most areas, with some locations rolling snake eyes, and other areas seeing some brief, heavier showers and thunderstorms, and picking up an inch or two. High temperatures, because of partly cloudy skies, should remain in the 90 to 95 degree range. 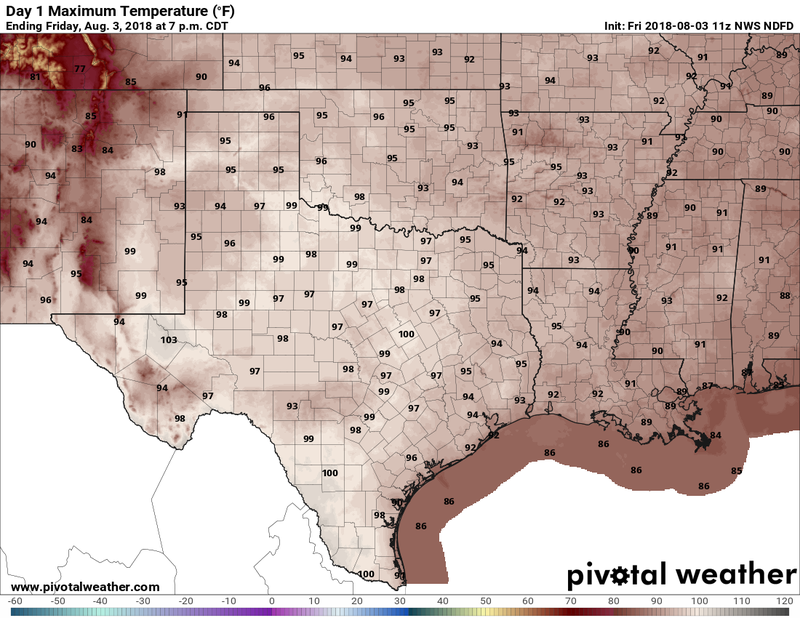 At this point it doesn’t look like rain chances will entirely go away next week, but they should diminish, and temperatures accordingly should push back up into the mid-90s (if not upper 90s for a day or two). 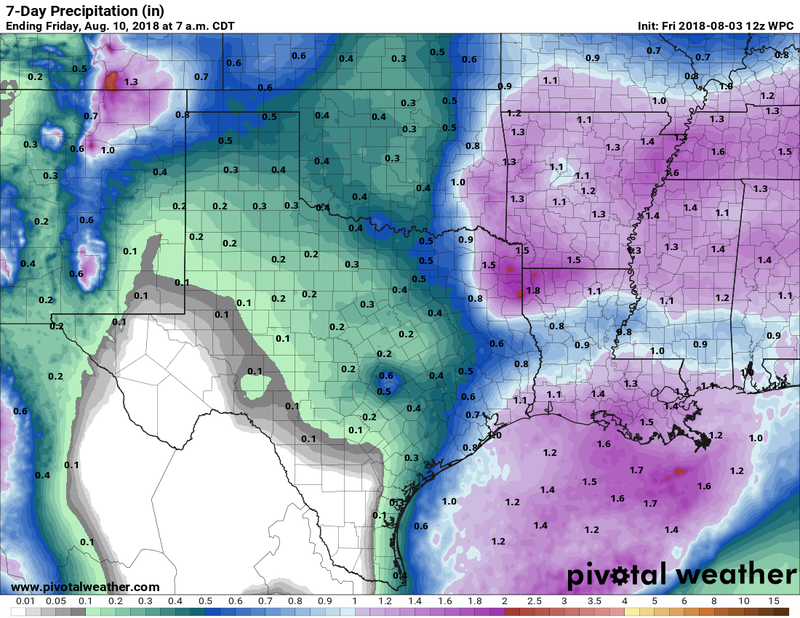 Looking really far ahead, the forecast models do bring some better rain potential back into the forecast for next weekend (like maybe 1-2 inches of rain) so we’re going to watch that for you. But at this point I’d characterize that as trying to divine the future from a hazy mist. So for now, have a great weekend. A hazy mist…. you mean Houston in the summer. Don’t take a deep breath, you might chip a tooth on the humidity. Are you insane? Or do you own a building supply store? I will take rain in August in Houston any day. Especially if the rain is not associated with a hurricane! Have a great weekend! You guys rock! Let me think about the best way to accommodate this. I’d like this too. Keep getting walloped in the sinuses. Can you make the rain go around my house on Saturday? I’m having a pool party. If it does rain, can we stay in the pool in the rain, as long as it is NOT thundering and lightning? Now is this rain enough that Katy will have to evacuate? 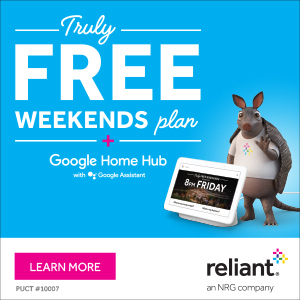 When my electric plan runs out and I’m searching around, do I express my thanks for this site by signing up specifically with Reliant? Or are any of the providers under the NRG umbrella fair game? Reliant is best. I’m hoping to have a discount offer for readers of this site at some point.